Zeeland, Mich. (AP) --- A lawyer has raised allegations about unclean conditions at Bil Mar Food’s plant in this western Michigan community in a wrongful death lawsuit filed on behalf of a Tennessee woman. Tainted meat from the Bil Mar plant has killed 11 people in 14 states and sickened approximately 72 people, according to the federal Centers for Disease Control and Prevention. Bil Mar, a division of Chicago-based Sara Lee Corp., on Dec. 22 recalled 15 million pounds of hot dogs and other packaged meat products sold under a variety of names. It said they could be tainted with listeria bacteria. 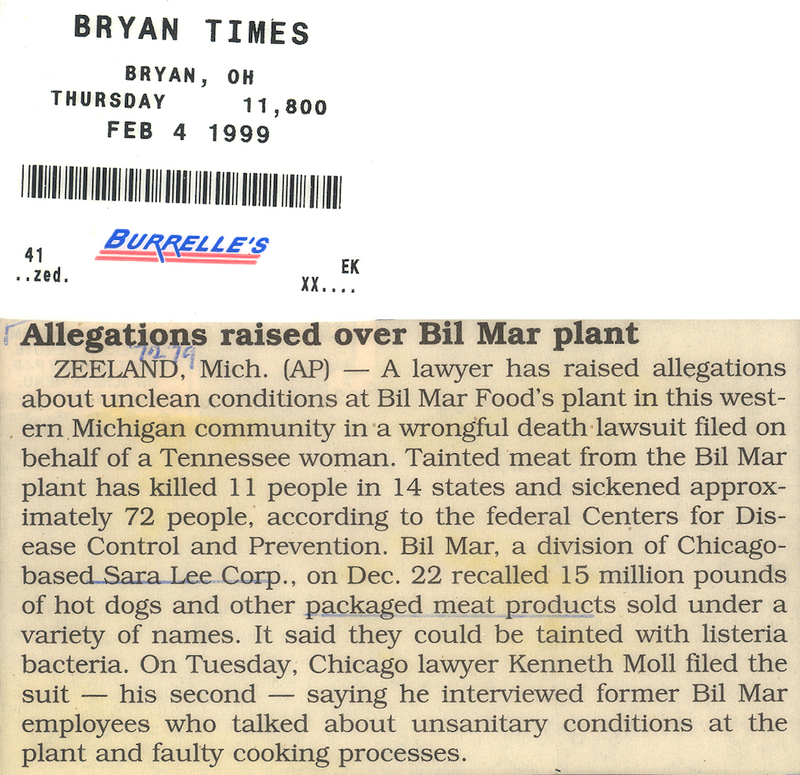 On Tuesday, Chicago lawyer Kenneth Moll filed the suit his second saying he interviewed former Bil Mar employees who talked about unsanitary conditions at the plant and faulty cooking processes.